How can a given virtual server be isolated and prevented from communicating with the external network while remaining in contact with other virtual servers and resources? A virtual server’s communication needs to be limited to only the virtual server and other resources it needs to remain in contact with, and isolated from all other parts of the external network. The virtual server is isolated via the use of an additional virtual switch, thereby isolating it from the traffic of other virtual servers. 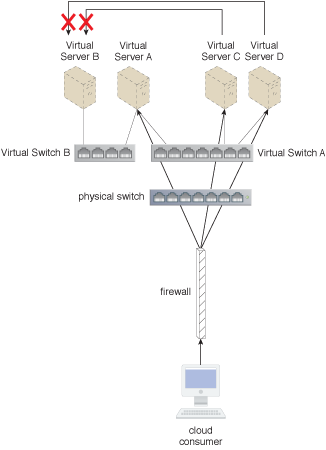 Virtual Server B is given its own virtual switch, so that it can be completely isolated from all other virtual servers besides Virtual Server A.